Marca | Catalan wine in a nutshell! Lovely cherry red color with violet edges. The youth is showing. Plenty of fine and dark tears. It has a fresh and expressive nose of blackberry, ripe dark cherry, mature fig and a slight hint of gingerbread, spicy notes. Smooth entry, friendly step with subtle but tasty red fruit nuances. The finish is offering some mineral expressions. Fruity aftertaste with white pepper corns coming through as a pick me up. A easy wine to drink but certainly it has character. I would like this with a red meat barbeque! The grapes used, Garnacha and Carignena, have been harvested from vines between 10 and 40 years of age. They are grown on altitudes between 250 and 300 meters in the municipalities of Marca and Capçanes, in the D.O. Montsant. The farming methods applied are organic and even though some minerality is noticed, the wines has been rounded of in a very attractive way, having spent 4 – 6 months on French oak. 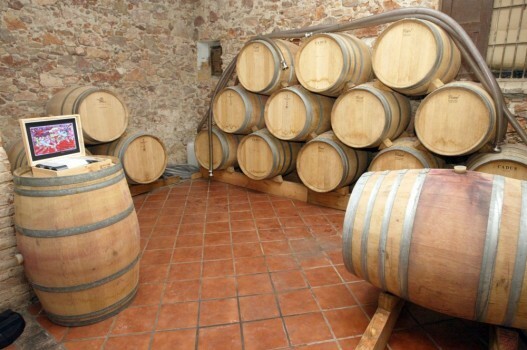 The small winery of Vendrell Rived is currently producing two red wines, the Serè and L’Alleu, the latter having a higher percentage of Carignena. The total production over the year is around 26,000 bottles. 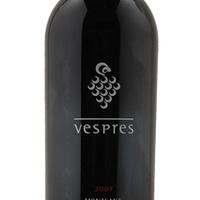 The Montsant appellation, in its current shape, was formed in 2001, one of the younger D.O:s. The Vendrell Rived winery was up and running only a year before that, in 2000 Josep M. Vendrell decided to take advantage of the riches the family possessed. 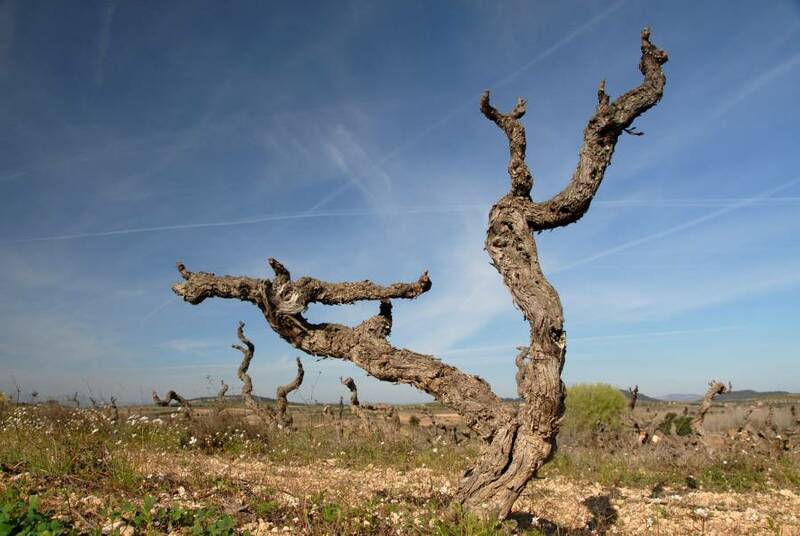 The old vines; the vines that have belonged to the family since the time of their grandparents’. Dark red, quite opaque with dense tears. Great volume of very fruity aromas in the nose. A range of black and red berries, not overly sweet. Additional notes of spices and cocoa adds depth and a wide aromatic dimension. The toffes appear over time. In the mouth it is elegant and tasty, with extraordinary finesse and long aftertaste. With a spectacular step, pleasant, harmonious and it expands on the palate. Full of smoothness and structure. To be fully enjoyed and appreciated from dawn too dusk! 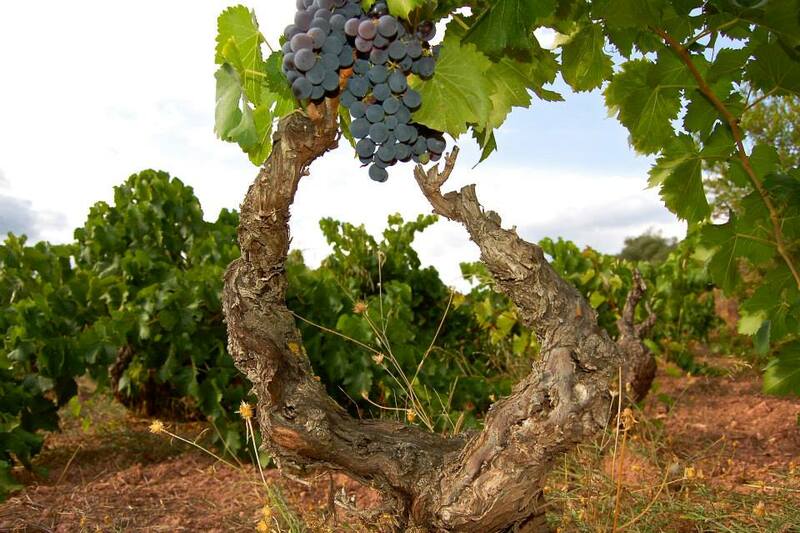 The Garnacha grapes used to make Vespres come from vines between 40 and 100 years of age. The harvest is manual and collected in crates of maximum 10 kg. Alcoholic fermentation and maceration takes place in stainless steel tanks for a period of 10 to 20 days. 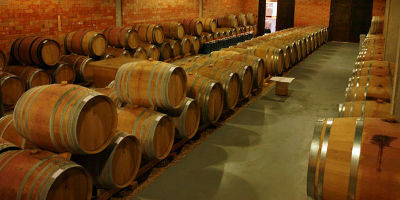 The malolactic fermentation takes place in barrels. Aging is between 9 and 11 months in barrels of 225 liters and 300 liters. It is a tribute to the Carthusian monks, that used to cultivate vineyards in this area. Everyday at sunset or at 18:45 they would pray the prayer called “Vespers”, after which they could access the daily single glass of wine. La Sierra de Montsant, The Montsant Mountain Range, makes sure that it doesn’t go unnoticed as it casts evening shadows over a landscape steeped in historic intrigue. But it is so much more than a provider of shadows and shade, it is highly necessary for the special microclimate that both the DOQ Priorat and DO Montsant enjoy. 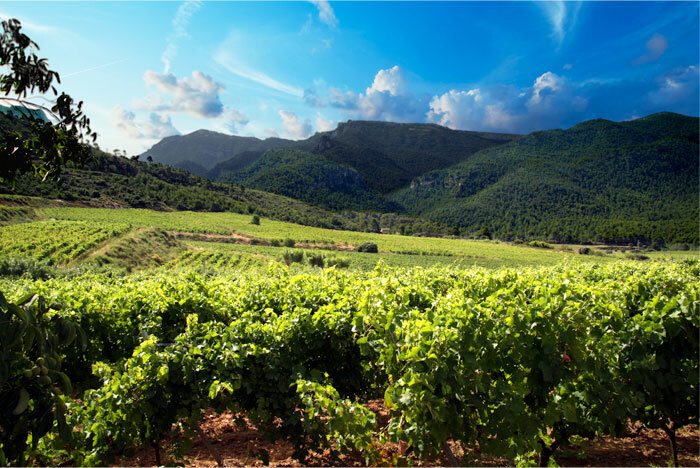 This mountainous ridge has given shape to a legendary wine region and birthed some of the worlds most distinguished expressions of terroir for the indigenous grapes Garnaxta, Garnacha (Grenache) and Samso, Carignena (Carignan). Vespres, Catalan for dusk, speaks from its origins. A rugged terrain where ascetic culture has struggled for a life woven with time and ’biodynamic’ principle. In vespers, ‘evening prayers’, earth’s life giving force was reflected in a cup of vi negre, ‘black wine.’ Symbolized with a grape cluster formed in light of 13 moons, Cellar Dosterras winemaker, Josep Grau gives a nod to the ‘natural order.’ His deft touch for balance allows just enough oak to serve up plenty of rich fruit from a prized small plot collection of old vines. Barcelona – Marçà, an easy 1 hour 40 minutes drive, southwesterly direction and way closer to the ancient city of Tarragona. Off course, one must take into consideration the temptation to maybe stop for a winery visit in Priorat, as it is on the way. Several signs trying to lure you to visit cellars, none of which are bad. Now, this time, that was not the reason we were slightly late for our appointment, rather the fact that we missed the winery and had to look for it in the village. The GPS hadn’t been updated for quite some time so the address was not coming up. Normally, in these small villages, people will know where the wineries are located, so we were surprised that none of the four people we asked, knew where it was. Is this winery supposed to be secret? Maybe I should stop writing right here? Had to call Albert and found the place within minutes. Thankfully, we were not the only ones being late, as the visit was a joint one with one more person. It doesn’t matter if you are late, as long as someone is later………. The origin of the name “Marçà” comes from the latin word “Martius”, which could either be translated as the month of March or the planet of Mars. Hence, the name is probably implemented by the Romans, as it is a known fact that they were highly present in this area for quite some time. The church of Marçà is already mentioned in the Pope Anastasio IV’s “bula in 1154. The Marçà Castle appears for the first time 1153, as being mentioned by Ramón Berenguer IV. In 1241, Guillem d’Entença’s wife, Alamanda became the owner of it, ant the title became possession of the Entença Barony. In 1324, Jaime II gave the castle to his son Ramón Berenguer, and it happened to be a part of the Earldom de Prades. In the 15th. century, some of the inhabitants of Marçà started to live down the hill. The inhabitants took the stones of the old village to build up the new one. Finally, the village was placed in its modern place in the 18th. century. At the end of the 18th. century, even though the population experienced a demographic increase, the village had serious troubles to pay its taxes. Carrasclet was a guerrilla fighter who used to live in Marçà with his wife (who was also his daughter), started to fight against Felipe V.
At the end of the 19th. century, the filoxera plaque deeply hurt the county, but Marçà did not suffer so bad because of the railway, which arrived to Marçà in 1891. This smoothed the crisis, and became for some years the best way to buy or sell the agricultural products of the Priorat. 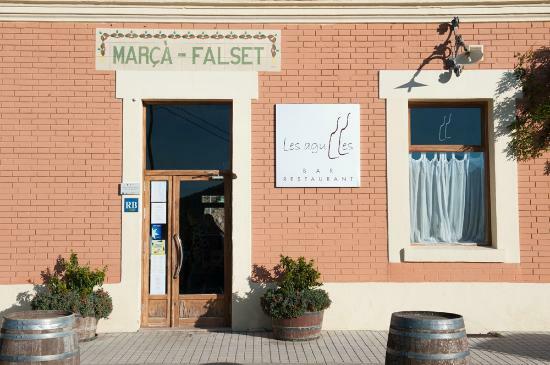 Today, one can eat really well at the railway restaurant Les Agulles in Marçà. 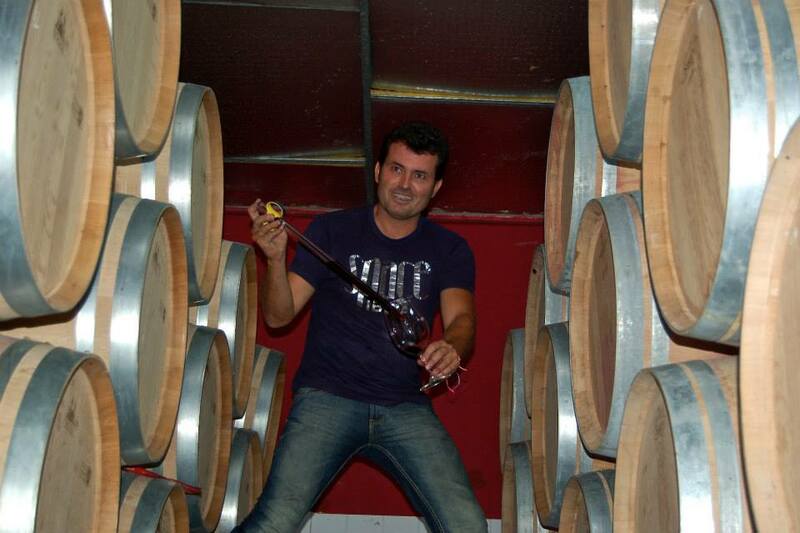 Albert Jané is the son of Benjamí Jané, proprietor of the winery Jané Venturain El Vendrell (DO Penedes). He has inherited his father’s prudence, meticulous work and love of terroir. One thing is certain and very evident once you get to talking with Albert, he is a very passionate winemaker. The kind of guy I can imagine sleeps amongst his vines. The two projects, housed in one winery, are Acustic & Ritme. 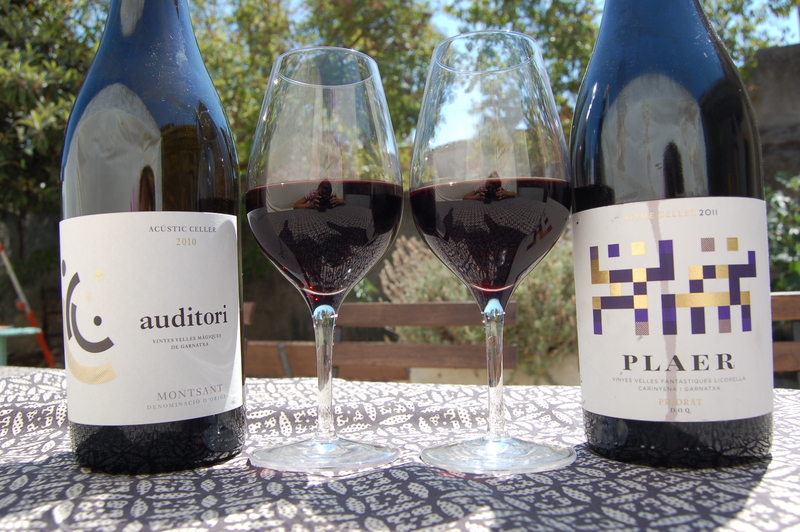 The former representing DO Montsant and the latter DOQ Priorat. During the visit his references are clear, the terroir, the vines and the love for wine is surfacing the whole time. I would have to say that Albert is modest in his claims but firm in his convictions, Alberts wines are made using traditional techniques, similar to “acoustic” music and that too would be his interpretation of the terrior. The wines are ​​only produced from native varieties: Carignan (Samsó), Garnacha Negra and Sumoll, and white Garnacha Blanca, Macabeo and Pansa. The philosophy of Albert Jané put into one sentence might be “Back to the roots, to the uniqueness of the native environment expressing the deepest of these invincible vineyards guarded by the majestic mountain of Montsant”. Acústic Celler maintains a small production of only one hundred and twenty thousand bottles. The challenge I have while tasting Alberts wines, is that I can’t stop tasting! As I will have to return to both Acustic Celler and Ritme Celler, to be able to convey my tasting notes for the other labels! 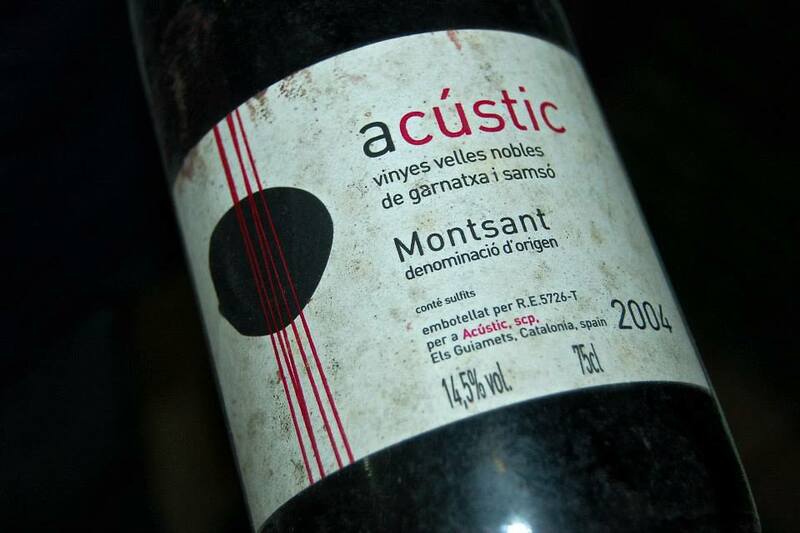 Auditori 2010, Acustic Celler, DO Montsant, 100% Garnacha. Pure pleasure, and as the top wine of Acustic Celler it displays and conveys the elaboration and terrior to perfection. Grapes from three old Garnacha vineyards, all 70 years and older. 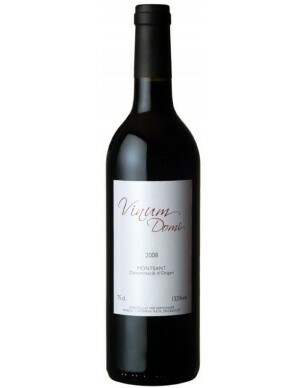 A full-bodied sensual sensation, with well ripened red fruits, cherry is clear. I distinguished some licorice and a little spiciness with clear oak as it progressed. Medium long finish. Nicely integrated tannins. Could easily stay in my cellar for another 4 years. The downside…….., not enough bottles on the market! produced from vines between 40 and 60 years, grown between 300 and 650 m altitude, on licorella (slate). Aged for 12 months in French oak barrels. This wine is not filtered or clarified, so you may find deposits. Ripe blackberry and cola aromas, hints of black pepper, smoky minerals. Washes over the palate with dark berry flavors. Closes bright and long, with gentle tannic grip and a zesty mineral quality. This wine has an attractive bouquet, the oak is evident but integrated with the fruits. The palate has a satisfying, succulent entry with fine acidity. Plaer is the Catalan word for pleasure, I say no more! I’m A Man Of Constant Sorrow…. … but only if I don’t get to drink wine like Ressons, otherwise I am pretty much a man of constant joy! 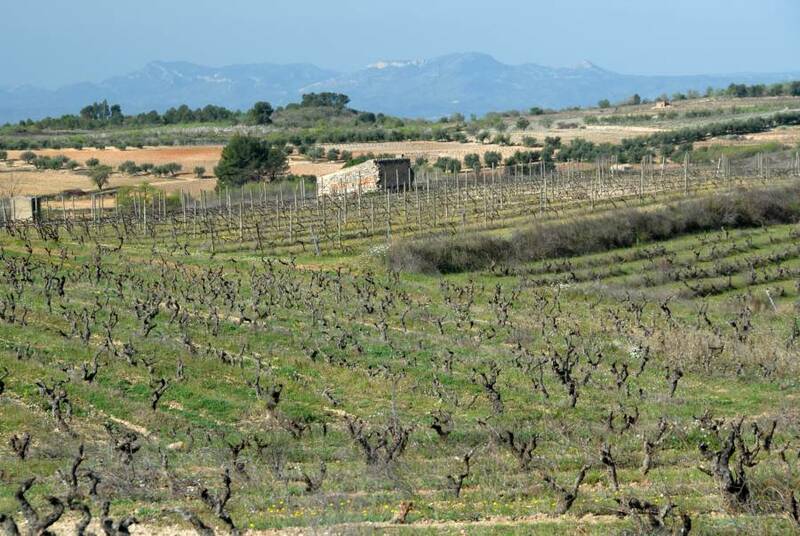 Going to Montsant, I’m wondering how many new wineries will pop up during this decade? 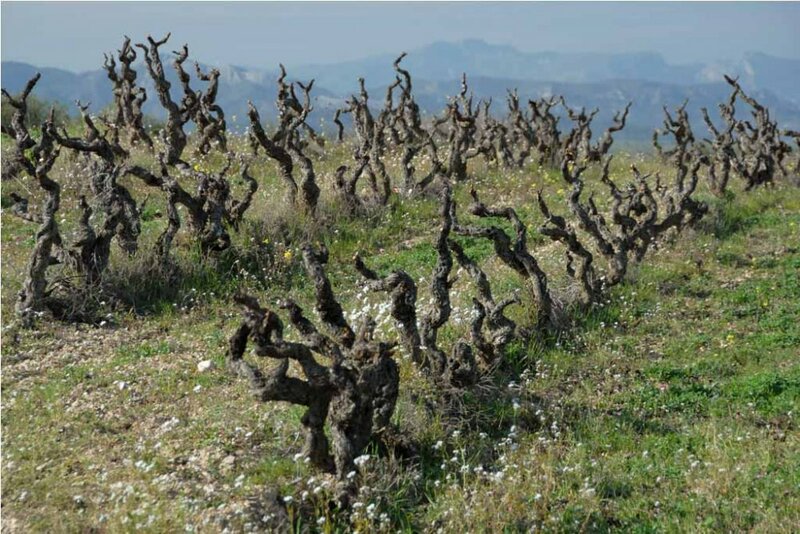 The transformation of Priorat was extreme and there are indications that some, less fortunate (or not so knowledgeable), are selling their cellars. 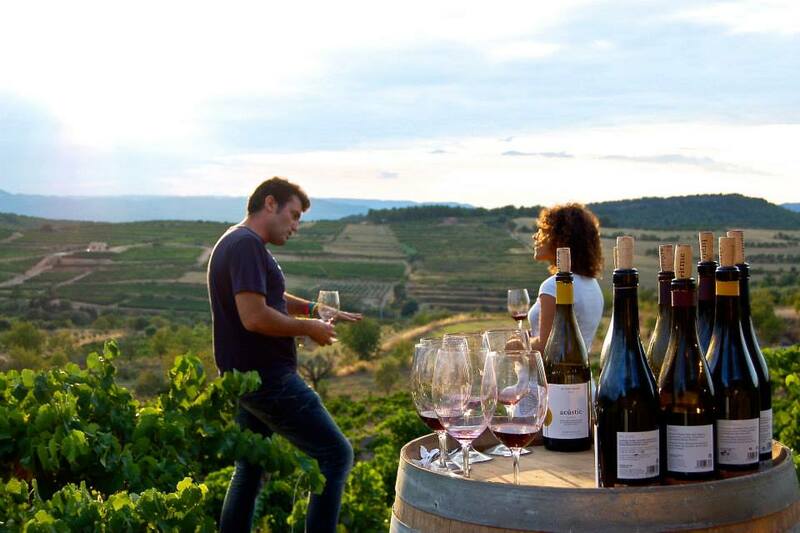 Making great wine is one thing, selling it is altogether another dimension. Failing to understand that it is not about what you know but rather who you know! 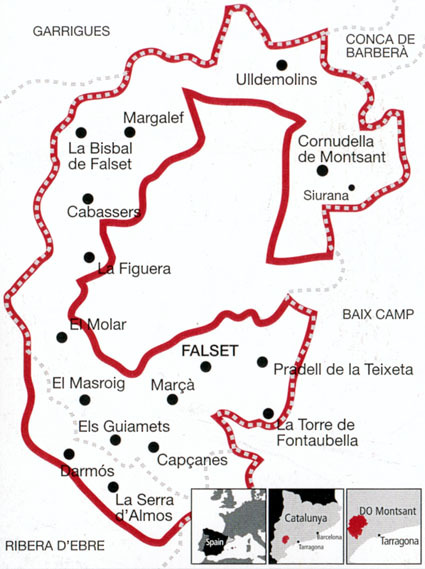 Montsant is still expanding, both in number of wineries and vineyards. Make sure you try at least one wine from Montsant during the week to come! Mas d’en Canonge was established in 2006. In terms of wine, that’s yesterday! Its owner, Salvador Alceda, comes from a family dedicated to the world of hospitality. It was not until he bought a farm in the town of Marçá, planted with old vines, that he saw the possibility of making his own wine. The promised land and perfect grapes, with a favorable setting. How hard could it be? He lacked the expert hands and started realizing that it wouldn’t be as easy as….., favorable conditions = great wine (that sells)! Right place at the right time, call it timing, faith or just good luck … and football! Fairly quickly he got to have a casual meeting with Toni Alcover (one of the best winemakers in Priorat), during a football match, as both their children play ball. The understanding was immediate and soon the first, 2007 vintage, was bottled. The project continues to move forward with the enthusiasm and effort of the entire team, and Mas d’en Canonge now has fully equipped new facilities, to carry out the entire production process, ending with labeling and storage. Having tried several of their wines, confidently I can say that this is a winery to watch! Ressons Clot de la Vella 2009, Garnacha 100% (from old vines). 12 Months in new 400 l. French oak barrels. The young queen of the winery, full of personality. The character is apparent immediately after uncorking but after some time and aeration, its complexity soon comes to life. Primary aromas are oaky and leathery, lovers of Bordeaux wines will enjoy this immensely. 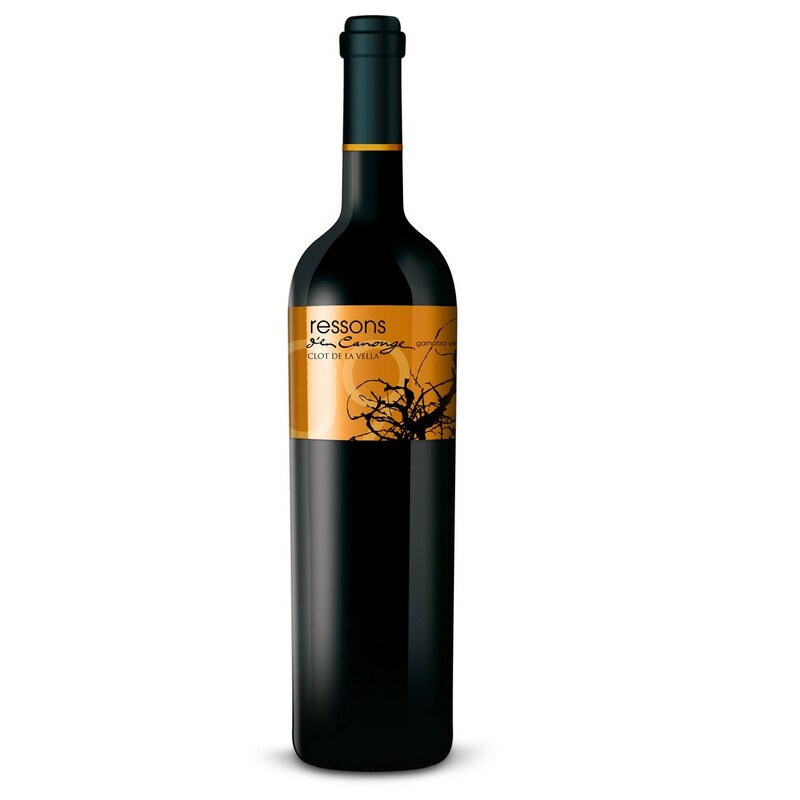 It is a intense wine, full of flavors of ripened black fruit, resinous touches and very powerful. It transmits the power of those old Garnacha vines, being well balanced, sweet and smooth. On the palate, ripe fruit, black fruit, a wine with volume and body, sweet, balanced, enjoyable. A wine that keeps on giving!